Tango is a dance for couples that originated in Argentina in the beginning of the 19th century. Dancing Tango is like speaking a language of the body, which the partners use to relate to both each other and the music. Improvisation and awareness is essential to Tango dancing. Bärbel has been dancing Tango since 1997 and teaching since 1999. Between 2006 and 2009, Bärbel spent a total of 11 months in Buenos Aires immersing herself completely in Tango. In her tango teaching she concentrates on smaller elements in tango from which more complex patterns are constructed. This opens up the possibilities of freedom of improvisation to the music and within the constraints of the social dance floor. She especially focuses on the body awareness and the quality of the movement so that the lead becomes clear and the embrace comfortable. Once mastered everybody can apply these techniques to any style of tango. You can attend regular tango classes with her in the UK in Newland & Lydney. 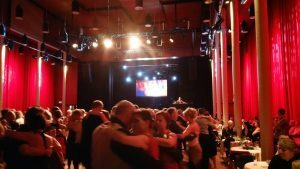 More about Tango Classes with Bärbel Rücker. Do you prefer personal tuition? Perhaps you’re not able to attend the group classes, or you prefer a different pace of learning? 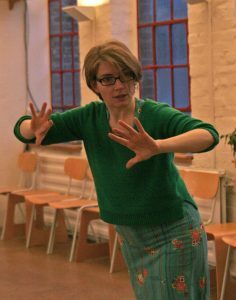 Bärbel Rücker (Moving Experience) offer private classes for beginners as well as for experienced dancers. More about Private Lessons with Bärbel Rücker. Amazing Argentine tango class last night at the Old Bream infant school with teacher Bärbel Rücker. All about axis, connection, weight change and much much more. Bärbel has a great teaching style and is able to give something to each of us. The 2 classes consisted of complete beginners, improvers and intermediates and yet she was able to ‘give’ something to each of us. To learn to do anything correctly from the start is frustrating and takes time . However to unlearn bad habits after years of dancing or discover you are missing fundamental technique is worse. Learning with Barbel will prevent that. So……. I experienced one of the most “expressive” DJs last night…..always smiling with joy in her eyes…..and looking at the audience and all dancers. she seems to enjoy the music as much as the dancers. A very pleasant experience. Bärbel Rücker is in my humble opinion my dream DJ … I vividly remember hearing her first at tango alchemy in Prague so many years ago – and yesterday I had the great pleasure of dancing to her music at the Magic Roundabout Milonga close to Chippenham. Wow. Her musicality, her collection of unusual and known music – it’s just in a league of it’s own. Wonderful. Just wonderful.